Check out the video on this sleek 87' Johnson motor yacht for sale! : Atlantic Yacht & Ship, Inc. Check out the video on this sleek 87′ Johnson motor yacht for sale! Be sure to check out the video on Chris Carroll’s beautiful used 87′ Johnson yacht that he has listed for sale. In the first place, this lovely used 87′ Johnson yacht is known as “Lady Alice.” As can be seen, this yacht was designed by renowned naval architect Bill Dixon. A main deck master suite offers a stunning 270 degree forward view. 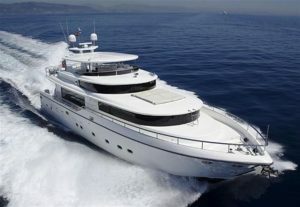 In fact, this yacht has a total four comfortable and spacious guest rooms! Of course, this graceful used 87′ Johnson is as mechanically sounds as she is comfortable. As can be seen with her desirable CAT C-30 diesel engines with less than 800 hours. Furthermore, these engines come with extended warranties! The large teak upper deck bridge is protected with a hard top. Moreover there is lots of space included a built-in settee for eight. Additionally the teak table, stainless steel grill, davit, and cooler will not disappoint. Furthermore there is a bar with granite counter top, refrigerator, and included ice maker. There are three crew berths and a garage for toys as well! For more information on this beautiful used 87′ Johnson yacht for sale contact Chris Carroll today!